Can Elop Make Nokia a Smartphone Contender? 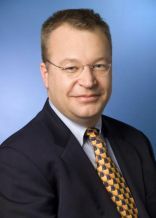 Nokia announced that Microsoft's Stephen Elop will assume the role of CEO effective September 21. Nokia is the global leader in mobile phones, but it's not even on the smartphone radar. With Elop taking over the reins, perhaps he can apply the knowledge and experience gained from heading Microsoft's Business Division and make the Nokia brand competitive in the smartphone arena. A Nokia press release announcing Elop's appointment as CEO explains "The Nokia Board believes that Stephen has the right industry experience and leadership skills to realize the full potential of Nokia. His strong software background and proven record in change management will be valuable assets as we press harder to complete the transformation of the company." With the growth of smartphone platforms like Apple's iOS and Google's Android, the future of the traditional mobile phone that makes up most of the Nokia portfolio is less certain. There will most likely remain some segment of the population that just wants a mobile phone to be a mobile phone, and will shun the added complexity of smartphones, but that will be a niche market that won't allow Nokia to sustain its leadership role. Commenting on his upcoming role as Nokia CEO, Elop said "Nokia has a unique global position as well as a great brand upon which we can build. The company has deeply talented and dedicated people, and I am confident that together we can continue to deliver innovative products that meet the needs of consumers. The Nokia slogan clearly states our key mission: Connecting People, which will acquire new dimensions as we build our portfolio of products, solutions and services." Right now, Nokia has a dominant stake in global mobile phone market share--with the brand being more popular internationally than it is in the United States. Nokia has cutting edge smartphones like the N8 in its arsenal, but in terms of smartphone market share Nokia is below Palm's WebOS which barely scrapes in at less than five percent. But, the strength of Nokia's brand, combined with its alliance to provide Microsoft Office Mobile on Nokia mobile devices, and its partnership with Intel on the Meego mobile OS platform provide Elop with all of the elements needed to compete more aggressively and be a smartphone contender. The iPhone and plethora of Android smartphones seem to dominate the smartphone narrative, but RIM is still the number one smartphone platform, and both Microsoft and Palm--now owned by HP--are on the verge of launching new mobile operating systems. The smartphone market is tough and there will likely not be a clearly dominant system, so there is room for Nokia to jump into the fray.